In the movie Waitress, the Food 'N Flix pick for December, Jenna (Keri Russell), is a waitress at The Pie Shack, married to her brutish husband Earl, reluctantly pregnant with his baby, and longing to win a pie championship and change her life. As a child, Jenna baked pies with her mother and now "escapes" by creating her own pie concoctions based on the emotions she is feeling and titled with fanciful names like Marshmallow Mermaid Pie (made when she was nine and in her "mermaid phase"), Fallin' in Love Chocolate Mousse Pie, Kick in the Pants Pie, and I Hate My Husband Pie, to name just a few. Waitress is a bittersweet comedy-drama, and a great little movie that will have you longing for a piece of homemade pie. Since I indulged a little too much for my liking over the holiday season, the thought of one more sweet baked good just didn't work for me and in fact made me feel a tad queasy and green around the gills. I wanted something a little lighter, a bit healthier, something to help me get back on track. It's either that or I am going to have to change the tag line of my blog from "...cooking, eating and living (mostly) healthy in Paradise" to "...cooking, eating and living (occasionally) healthy in Paradise!" 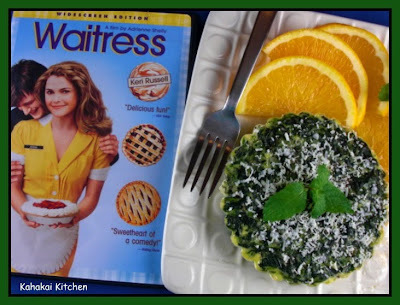 ;-) So I set out to find a simple quiche recipe. 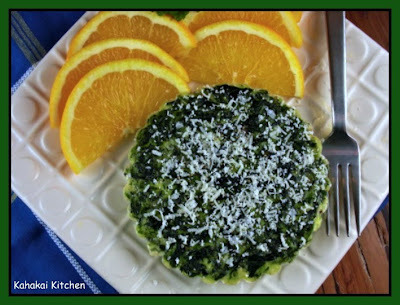 Enter the Crustless Spinach Quiche from one of the cookbooks sitting on my review stack, "The Good Neighbor Cookbook: 125 Easy and Delicious Recipes to Surprise and Satisfy the New Moms, New Neighbors, Recuperating Friends, Community-Meeting Members, Book Club Cohorts, and Block Party Pals in Your Life!" by Sara Quessenberry and Suzanne Schlosberg. (Yep, it's a movie review, a dish inspired by the movie, and a cook book review all in one post!) This compact paperback book has 125 recipes for any occasion when you want to be a good friend or neighbor. The recipes are organized into 7 sections with dishes appropriate for Bringing Home Baby, Get Well Soon, Welcome to the Neighborhood, Block Parties and Barbecues, Meet and Eat: Community, Religious, and Business Gatherings, Novel Ideas for Book Clubs and Condolences. The book contains recipes that are easy to make and transport well, and each section also contains tips and ideas for further neighborly actions like organizing a "meal train" for a new mom, putting together a "welcome to the neighborhood" list for your new neighbors, and "the art" of assembling a cheese platter. The authors have experience in creating easy and delicious recipes, Sara Quessenberry was formerly the recipe developer and food stylist for Real Simple magazine, and Suzanne Schlosberg is a health, nutrition, and parenting writer, a former senior editor for Shape magazine and the author of several health and lifestyle books. There are no pictures, just illustrations, but the recipes are laid out well and most contain helpful tips and suggestions for the cook. Some of the recipes I tagged to make included Sweet Potato and Rice Soup, Cranberry Granola Bars, Roasted Cauliflower Macaroni and Cheese, Cucumber, Feta and Dill Salsa, Tomato and Oregano Flatbread, Chocolate Chip and Candied Ginger Brownies, and Italian Sausage and White Bean Bake. This is a good book when you are looking for crowd-pleasing recipes that show you care but that are easy enough to work into a busy schedule. 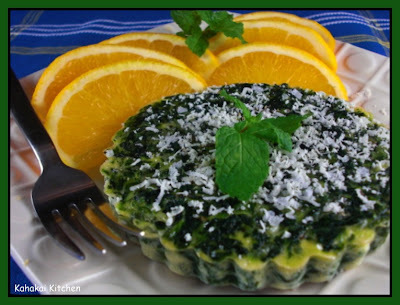 The Crustless Spinach Quiche from the "Meet and Eat" section of the book sounded simple, tasty, and like a good way to get some more healthy greens into my diet. For fun and portion control, I decided to use my small tart pans and make individual quiches. 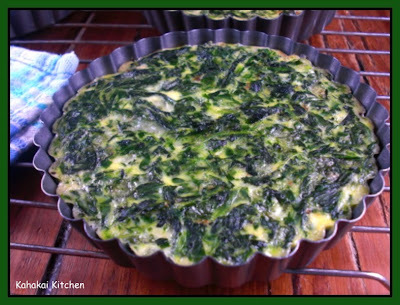 In honor of Jenna, I am enhancing the recipe title a bit and calling it "Too Much Indulging is Making Me Green" Crustless Spinach Quiche. Served with some sunny orange slices and topped with a little extra grated Gruyere, it makes a great way to start the morning or a light lunch. "The Good Neighbor Cookbook" says, "Packed with spinach and bolstered by eggs, this savory quiche is nutritious and satisfying, an ideal choice for a long meeting that overlaps with mealtime. Because it's crustless, the quiche is super-quick to make and easy to serve as a finger food. No crumbs!" 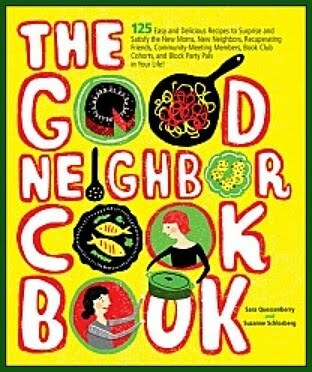 from: "The Good Neighbor Cookbook"
Preheat oven to 375 degrees F. Butter a 9-or 10-inch pie plate. In a large bowl, combine the eggs, milk, and cheese. Squeeze the spinach of any excess water and stir into the eggs along with the nutmeg, salt, and pepper. Pour the mixture into the prepared pie plate and bake until puffed and the center is just set, about 45 minutes. Slice the quiche into wedges or squares and serve warm, at room temperature, or chilled. Cook's Tip: A quick way to thaw frozen spinach is too place it in a colander and run it under hot water. Be sure to squeeze out all of the excess water. Notes/Results: Tasty and satisfying. Chock full of nutrient-packed spinach and nutty Gruyere cheese, this is a hearty but not heavy quiche. I did use skim milk instead of whole as it was I had on hand, but I don't think it was noticeable. Also, I reduced the recipe by half which made 3 small tart pans of quiche and I cooked them about 32 minutes to accommodate the smaller size. This is a simple quiche but the Gruyere adds good flavor and creaminess. If you wanted, a little turkey or bacon would also be nice chopped and mixed in. It does hold together well, so if I were making for a meeting or larger group, I would use a pie pan or a square pan and cut into slices or squares. Quick and simple, I would make this again. Food 'N Flix is having a November-December double feature of The Ramen Girl and Waitress and will be rounding up all the dishes inspired by both movies at the beginning of January, so stop by and check it out. *Cheese Lover's Choice Contest Voting: If you have voted already just bypass this little reminder but if you have not yet voted for my Ile de France Camembert Sliders, I would love it if you would. My cheesy mini burgers are in the Top 10 Finalists in the Cheese Lover's Choice Fan Voting Category of the Camembert Contest and I would love your vote as I seem to be between 2nd and 3rd right now. ;-) If you click here, it leads to the site where you can give me (Deb C. on the poll) the number of "stars" you think appropriate for my dish. (Of course 5 star votes are more than welcome! ;-) lol) Voting is open until January 5th. 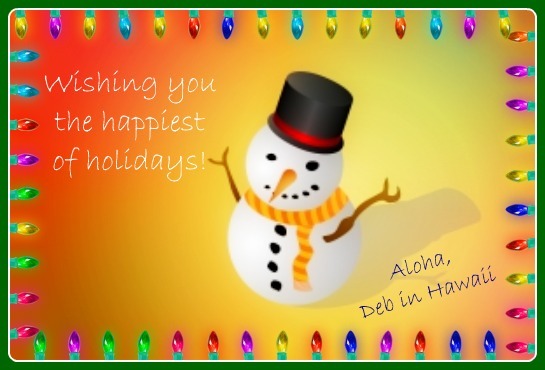 Mahalo for your time! 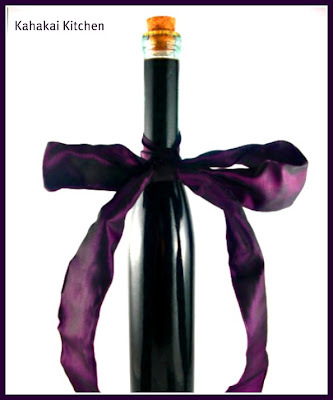 Have a happy, healthy New Year's Eve! Sure, sometimes hovering over the bowl of chili cheese dip, Fritos bag in hand is the way to go for satisfying appetizers. But sometimes (especially after a month or two of indulging a bit more than you should have), you want something lighter. 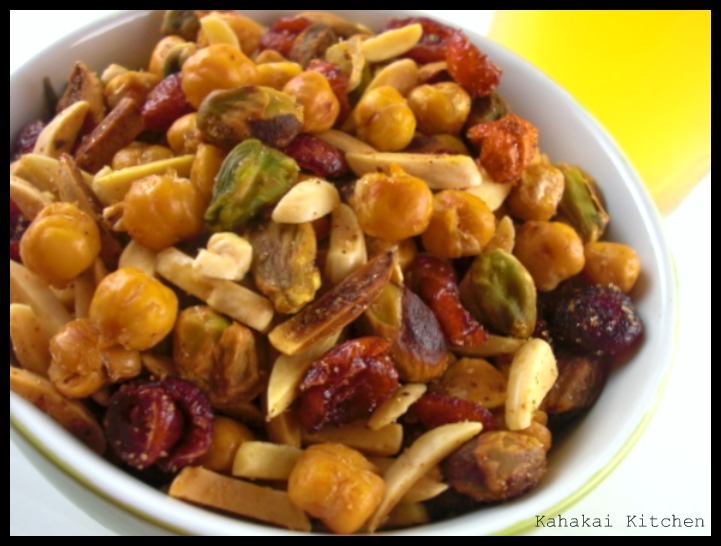 But it still has to be satisfying and full of flavor, like Giada's nicely spicy mixture of Toasted Cecchi, Almonds, and Pistachios. You get a nice crunch from the roasted cecchi (chickpeas) and nuts, a good little hit of protein, plus the seasoning of fresh rosemary and thyme along with the cayenne gives lots of flavor. 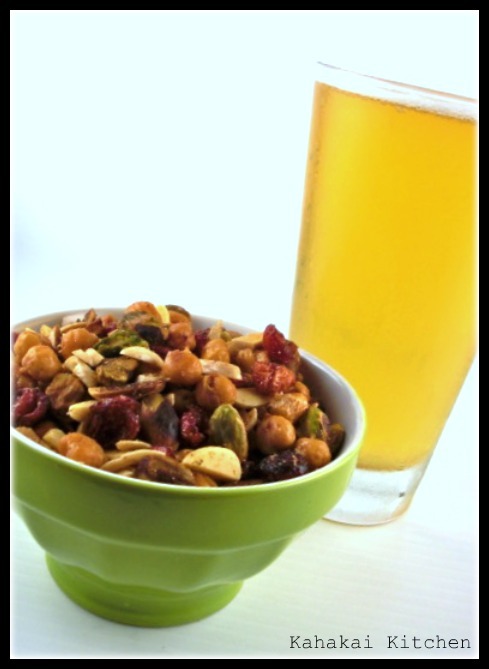 The only thing missing for me was a little bit of sweet, so I added some dried cranberries to the mix...perfect! 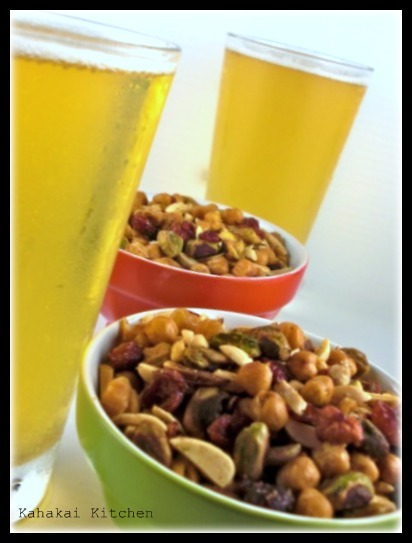 To go along with--Giada's Apple Cider Shandies, lager beer and sparkling apple cider. Crisp, slightly sweet and refreshing. Pupus and drinks on the lighter side, or maybe a good kick-off nibble to a bigger celebration. You can find the Toasted Cecchi Mix recipe here at Food Network. Place the garbanzo beans on a foil-lined baking sheet. Toss with 1 tablespoon of olive oil and spread the beans in a single layer. Place in the oven and bake until golden, about 30 minutes. Remove the garbanzo beans from the oven. Add the remaining ingredients to the garbanzo beans and carefully stir to coat all the beans and nuts. Spread the mixture out to a single layer. Bake for 10 more minutes. Let cool slightly (add dried cranberries) and place in serving bowls. Notes/Results: Excellent--a good mix of flavor and texture. The recipe was good as written, but adding the sweet, slightly tangy cranberries made it all the better as it played off of the cayenne spice nicely. I also like the slivered almonds in this as it makes it a little easier to munch on than the whole almonds would have. There was some back and forth on the reviews at Food Network about soggy chickpeas, temperatures, cooking times, etc. I did reduce the oil in mine by about 1/2 but kept everything else (temps and times) the same and it worked well for me. Pulled directly out of the oven, I thought my cecchi might not be crisp enough, but once they had cooled down completely they were perfectly crunchy. I would say know your oven and adjust accordingly. I will make this again. Cook's Note: The ingredients can be divided and served in 2 smaller pitchers. 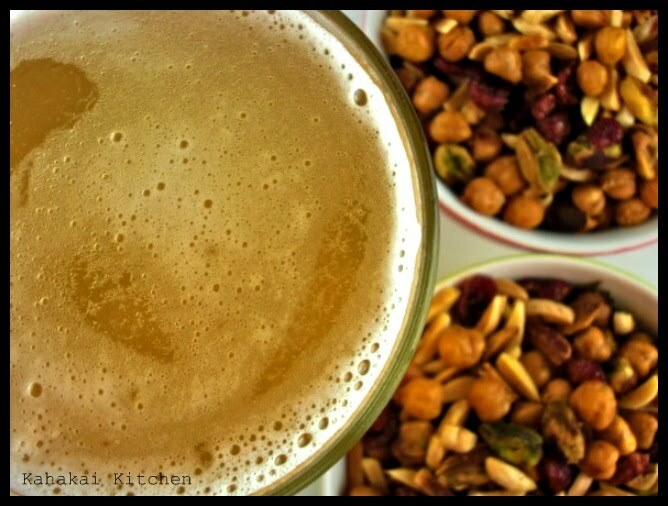 Notes/Results: Refreshing, not too sweet, and great with the roasted bean and nut mixture. I have developed a fondness for shandies over the past year or two (another good one to try is Tyler's Cranberry-Apple Shandy). I will make this one again. Our theme at I Heart Cooking Clubs this New Year's week is "Celebrate." You can see what appetizers and/or drinks the other IHCC participants chose for their celebrations by going to the post here and following the links. Not to be a nag but expect to see this little footnote at the bottom of my posts for a few days. If you have voted already--sorry but there are prizes at stake! ;-) If you have not voted for my Ile de France Camembert Sliders, I would love it if you would. My cheesy mini burgers are in the Top 10 Finalists in the Cheese Lover's Choice Fan Voting Category of the Camembert Contest and I would love your vote. If you click here, it leads to the site where you can give me (Deb C. on the poll) the number of "stars" you think appropriate for my dish. (Of course 5 star votes are more than welcome! ;-) lol) Voting is open until January 5th. Mahalo for your time! 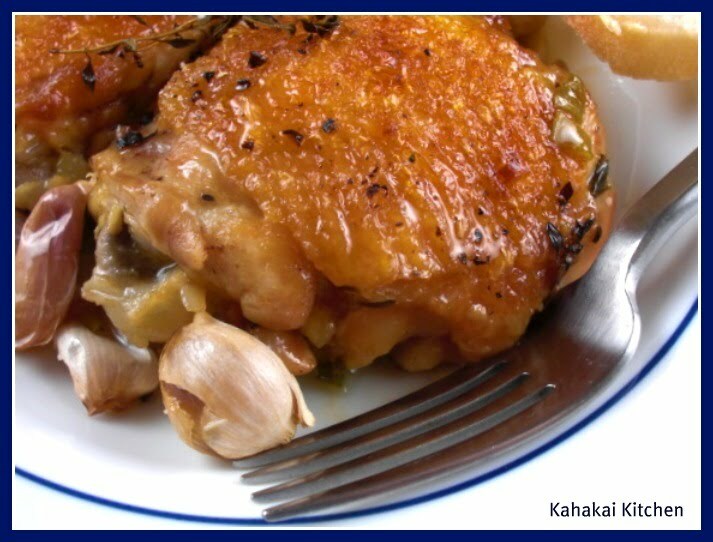 Here in all it's browned, slightly crispy-skinned, moist and tender glory is Nigella's Chicken with 40 Cloves of Garlic. 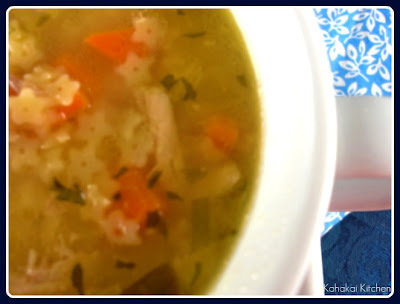 The recipe that begat the Garlicky Chicken Soup I posted on Sunday. Easy, flavorful comfort food at its best and a great example of the recipes in Lawson's newest cookbook "Nigella Kitchen." I vowed I was not going to buy this book due to having way too many cookbooks (yes, I am finding there may likely be such a thing as having too many cookbooks), but I have to blame this purchase on the mouthwatering review of the book that girlichef posted recently. I thought maybe I would just take a peek at it even though I wasn't going to buy it... That was followed by finding the book on sale for 50% off, having an additional 25% off coupon, and finally adding in my 10% membership discount at Barnes and Noble. I love a bargain and how could I resist getting this one for less than $12.00? I took it as a sign. ;-) The book is already covered with colored tabs of the different recipes I want to make but this recipe caught my eye and I knew I had to make it first. 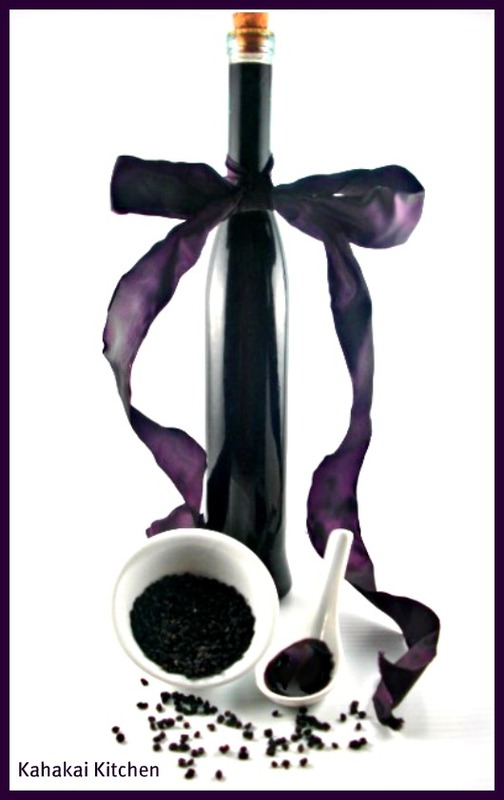 Nigella says, "When I was young, this old French classic was still - though in a quiet way - very much in vogue. I dare say it was because the novelty of using so many garlic cloves had not worn off; it seemed somehow dangerously excessive. Even so, I don't think anyone would think it quite unremarkable now to put 40 cloves of garlic in a casserole. Certainly, if you peeled and chopped - let alone minced - the garlic, it would be inedible, but garlic cloves cooked encased in their skins grow sweet and caramelly as they cook, like savory bonbons in their sticky wrappers, rather than breathing out acrid heat. This is a cozy supper, not a caustic one. It is not quite the classic version (not that there is only one: food is as variable as the people who cook it) but it sticks to the basic principles. Maybe because the white meat on chicken tends towards the utterly tasteless these days, I prefer to use not a whole chicken, but thigh portions only. Naturally, this wouldn't make sense if you were raising your own chickens, then slaughtering them for the pot, as was the custom when this recipe came into being (and very good it would have been, too, for adding oomph to an old bird) but if you're following the contemporary shopping model, it works very well. For some reason, I veer towards recipes that can easily be cooked in one of my wide and shallow cast-iron Dutch ovens and this fits the bill perfectly. By all means, add some steamed or boiled potatoes alongside if you wish, but I'd prefer, by far, a baguette or two to be torn up and dunked into the flavorsome juices; though don't rule out the option of sourdough toast, which is the perfect vehicle for spreading the sweet-cooked garlic onto. Otherwise, some green beans or baby peas or a plain green salad is all you need for a sure-fire salivation-inducing supper." Heat the oil on the stovetop in a wide, shallow ovenproof and flameproof Dutch oven (that will ultimately fit all the chicken in one layer, and that has a lid), and sear the chicken over a high heat, skin-side down. This may take 2 batches, so transfer the browned pieces to a bowl as you go. Once the chicken pieces are seared, transfer them all to the bowl. Finely slice the scallions, put them into the Dutch oven and quickly stir-fry them with the leaves torn from a few sprigs of thyme. 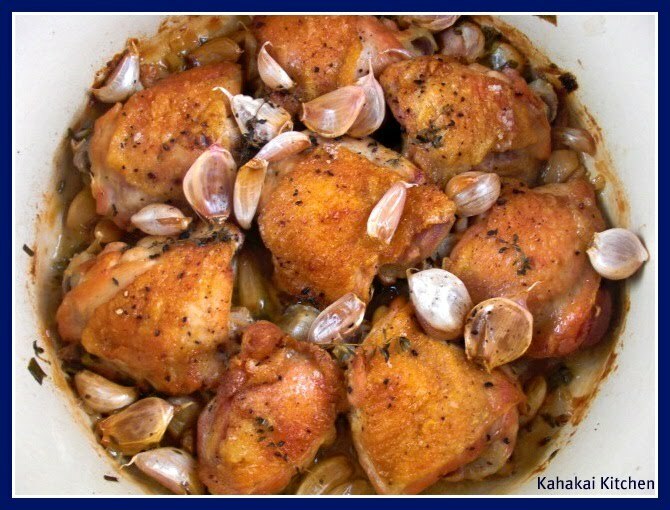 Put 20 of the unpeeled cloves of garlic (papery excess removed) into the pan, top with the chicken pieces skin-side up, then cover with the remaining 20 cloves of garlic. Add the vermouth (or white wine) to any oily, chickeny juices left in the bowl. Swish it around and pour this into the pan too. Sprinkle with the salt, grind over the pepper, and add a few more sprigs of thyme. Put on the lid and cook in the oven for 1 1/2 hours. 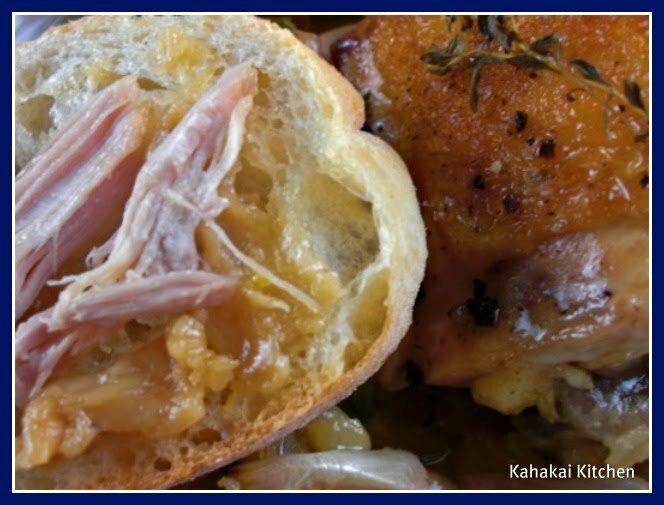 Make Ahead Note: Chicken can be browned and casserole assembled 1 day ahead. Cover tightly and store in the refrigerator. Season with salt and pepper and warm the pan gently on the stovetop for 5 minutes before baking as directed in recipe. Making Leftovers Right: If I do have any chicken left over - and I don't think I've ever had more than 1 thigh portion - I take out the bone then and there and put the chicken in the refrigerator. 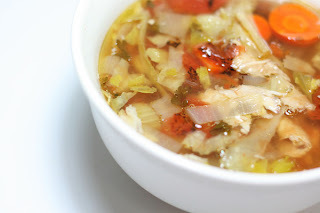 Later (within a day or two), I make a garlicky soup, by removing the chicken, adding some chicken broth or water to the cold, jelled juices, placing it over a high heat and, when that's hot, shredding the chicken into it and heating it through thoroughly, till everything is piping hot. You can obviously add rice or pasta. Otherwise, mash any leftover garlic into the concentrated liquid (which will be solid when cold), chop up some leftover chicken, and put it all into a saucepan with some cream. Reheat gently until everything is piping hot, and use as a pasta sauce or serve with rice. Notes/Results: Really good--so much delicious flavor. The garlic is so sweet, mellow and creamy and the juices from the steaming (I used white wine), flavored with the scallions and thyme are delectable. My only beef is that I would have liked a bit more "sauce" with this one as good as it tastes--so next time I might add a bit more wine or a little chicken stock to get more of the sauce factor. 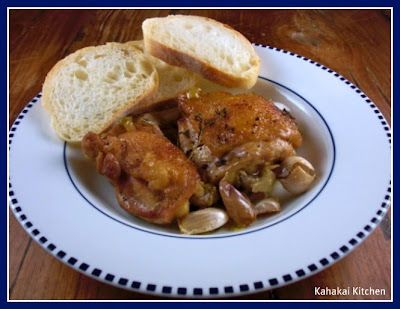 I ate this simply with slices of soft baguette to smear the garlic on and enjoy with the tender chicken. In fact if serving this for company, I would just give everyone their own small baguette to eat with their chicken and creamy garlic. The next night, I smashed/mashed a couple of potatoes and mixed them with some of the garlic puree to accompany the chicken. Then of course there was the soup--homey and excellent. I will definitely make this again. 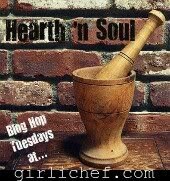 This is good, warming, soul-filling food so I am sending it along to the Hearth 'n Soul Blog Hop hosted by girlichef and some other wonderful bloggers like A Moderate Life, Hunger and Thirst, and Frugality and Crunchiness wth Christy, and Alternative Health and Nutrition News. Check out the round up for all kinds of fabulous recipes. BTW: If you have not had a chance to go over to the Ile de France Cheese site and vote for my Ile de France Camembert Sliders, I would love it if you would. 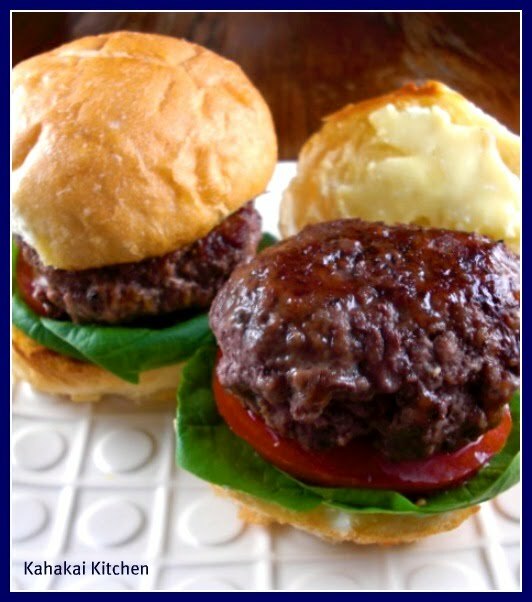 My cheesy mini burgers are in the Top 10 Finalists in the Cheese Lover's Choice Fan Voting Category and I could sure use your vote. If you click here, it leads to the site where you can give me (Deb C. on the poll) the number of "stars" you think appropriate for my dish. (Of course I won't turn down any 5 star votes. ;-) lol) Voting is open until January 5th. Mahalo! This post is a just a bit backwards because I am showing you the re-purposed leftovers first, instead of the original dish. This delicious Garlicky Chicken Soup was made with the delicious leftovers of Nigella Lawson's delicious Chicken with 40 Cloves of Garlic, which I won't post until next week, but I assure you, was as mentioned...delicious. 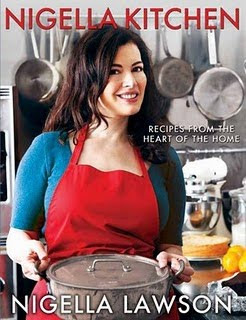 ;-) The recipe for the chicken, besides being on the Food Network website, can be found in her newest book "Nigella Kitchen." Nigella says, "Making Leftovers Right: If I do have any chicken left over - and I don't think I've ever had more than 1 thigh portion - I take out the bone then and there and put the chicken in the refrigerator. Later (within a day or two), I make a garlicky soup, by removing the chicken, adding some chicken broth or water to the cold, jelled juices, placing it over a high heat and, when that's hot, shredding the chicken into it and heating it through thoroughly, till everything is piping hot. You can obviously add rice or pasta." I stirred the "cold, jelled juices" leftover into 4 cups of my homemade chicken stock, squeezed in about 10 cloves worth of the leftover roasted garlic, added about 1/2 of a medium carrot diced, and brought it to a boil for about 5 minutes. I then added about 3/4 cup of dried stelline (little stars) pasta and cooked for another 5 minutes, before adding the shredded meat of two of the leftover chicken thighs and cooking for another couple of minutes until the pasta was tender and everything heated through. I then seasoned with salt and fresh ground black pepper to taste. It made about 2 large (2 cup) servings. Notes/Results: The comfort of a childhood favorite Campbell's Chicken n' Stars soup, but about 10 times better. Lots of soft, mellow garlic and chicken flavor and chock full of the little pasta shapes. (BTW--don't be freaked out on the amount of garlic--since it has roasted / braised along with the chicken it is very mellow and it really does not overpower the other ingredients--it just adds delicious flavor.) If you are feeling stuffy and out of sorts with the world, this is the soup to help clear it out of you. The chicken on it's own (more on that later this week) is well worth making, but make sure to reserve a piece or two and some of the garlic to make this homey, satisfying soup. I will make this again for sure. We have a small collection of wonderful, warming soups this week from the hardy souls who took the time to make a pot of soup during the busy holiday. Let's take a look. 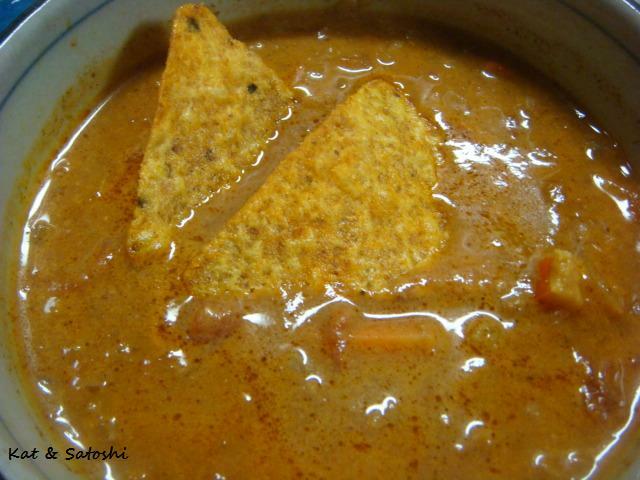 First up my friend Kat from Our Adventures in Japan made a spicy bowl of goodness, Kat's Taco Soup. Kat says, "In January, I threw together a chili soup. Then the other day, one of my Twitter friends tweeted about making taco soup. It is definitely soup weather here so I threw a taco soup together too.This was so easy and delicious. I think if you make this thicker (less water), you could use it as a topping for nachos. I didn't add any salt as the seasoning packet & cheese have lots already." Debbi from Debbi Does Dinner... Healthy & Low Calorie took another favorite food, pizza and used it for a slow cooker Pizza Soup. Debbie says, "This is a family favorite. We've adapted it quite a lot to suit our family. My little one loves pasta but isn't too much of a soup fan. I add a LOT of noodles to this and it ends up more like a casserole than it does a soup. It resembles a soup the first day but the leftovers are completely like a casserole." 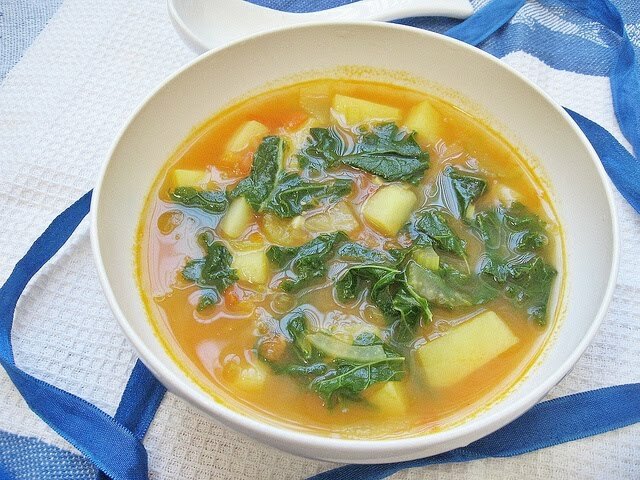 Tigerfish from Teczcape-An Escape to Food made a hearty Kale and Potato Soup this week and says. "This can become my favorite cooking tip or kitchen quote: When in doubt, add tomatoes. I wanted to make kale the main-dish for me this time, not as a side such as Kale with Garlic and Mushrooms and Garlic Kale Stir-Fry. Tomatoes come save me! Make me an appetizing delicious soup! The kale soup would not have made it without the tomatoes. Come on, simply sauteing the onions and garlic, plus some broth then adding those kale is not going to make me my kind of soup. But with tomatoes? 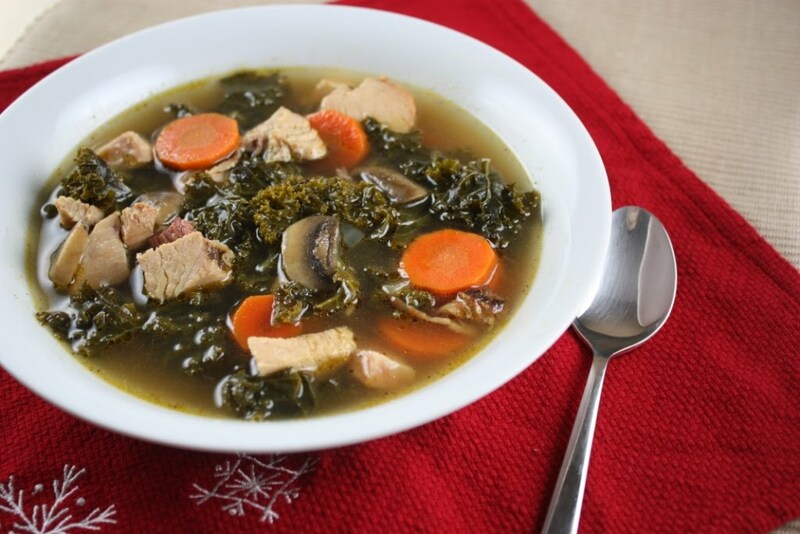 Definitely"
Another kale fan, Lori at Fake Food Free used leftover turkey from the grill to make her Smoky Turkey and Kale Soup. 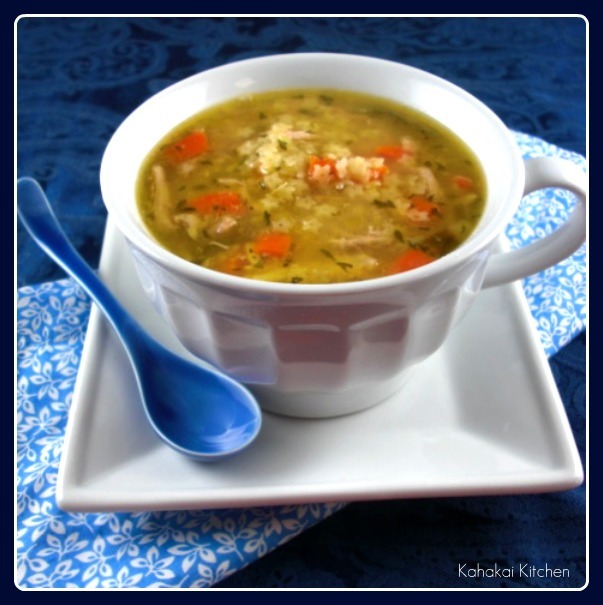 Lori says, "If you have smoked turkey, it adds such a complex flavor that makes the soup. I cut some breast meat and then I also placed a turkey leg in the soup to reheat for about 5 minutes, removed it and cut off some of the meat to add back to the soup. You can do this with any leftover pieces, or you can simply add cooked and shredded or chopped turkey meat at the end." Finally Nicole from Cocoa and Coriander tried to find a split pea soup that both she and her boyfriend could agree on and tried this Lemony Split Pea and Broccoli Soup. She says, "I loved this dish for its creamy texture, light flavor and heartiness, but perhaps most of all because of the tangy quality that the lemon juice and zest gives it. Matt, however, thought the lemon was overwhelming and he felt that it just didn't taste like split pea soup. I am going to have to try making a more classic version of split pea soup for Matt...but this is a great version for someone who doesn't need a recipe to be anything like the original." 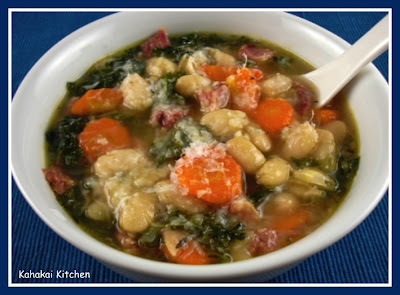 There you have it, a terrific small batch of five soups--perfect to keep you warm and cozy on a cold winter's night. Thanks to Kat, Debbi, Tigerfish, Lori and Nicole for joining in this week. If you have a soup, salad or sandwich that you would like to share, just click on the Souper Sundays logo on the side bar for all of the details. A very Merry Christmas to all of you who bless my life. There is just something about toasted bread crumbs on top of pasta that makes my heart quiver. The crunchy crisp topping with the tender pasta beneath is the perfect textural pairing. I love my own pasta/breadcrumbs recipes, like this Lemony Capellini Pasta with Bread Crumbs, Capers & Garlic, I adored Mark Bittman's Pasta with Bacon and Bread Crumbs, and since it is Potluck week at I Heart Cooking Clubs, I thought I should give Giada's Orecchiette with Toasted Bread Crumbs a try. I wouldn't be me if I didn't make a few changes to the recipe--based on what I like and what I had on hand. For example, I rarely have Italian breadcrumbs in the pantry but I always have panko, so I made my own Italian-style panko mix by adding dried oregano, basil, thyme, rosemary and garlic. Instead of prosciutto I used some spicier Hot Copocolla--it just gives it a bit more zip. 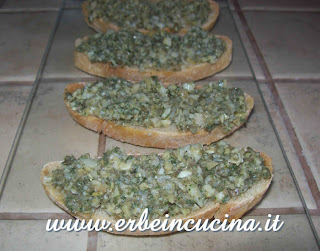 Finally, seldom do I allow an opportunity to use my beloved capers go by, so I added some to the recipe. This recipe can be found in "Everyday Italian" (pg. 89) or at the Food Network here. Giada says, "Most of us think of bread crumbs as a coating for frying. 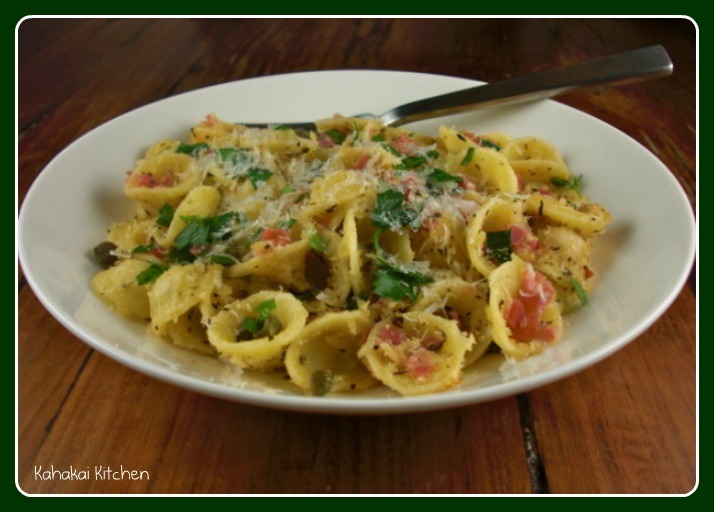 But in Italian cooking, bread crumbs are also used as a main ingredient, as in this pasta dish. This recipe probably came about as a way to use up leftover stale bread--a humble inspiration for a fantastic dish. I love this dressing with orecchiette ("little ears") but any small shape will do." In a large pot, bring to a boil 6 quarts of salted water. Cook pasta until al dente, about 8 minutes. Meanwhile, in a medium-sized saute pan, heat the oil until warm. Since the bread crumbs will cook quickly, you don't want to add them into a hot pan, otherwise they can burn. Add the breadcrumbs and stir constantly. Season lightly with salt and pepper since flavored bread crumbs may already have seasoning. Saute for about 2 minutes. Remove from heat and set aside. Drain pasta in a colander. Working quickly, add pasta to the saute pan and stir to combine. Add Parmesan and the chopped prosciutto. Mix thoroughly. 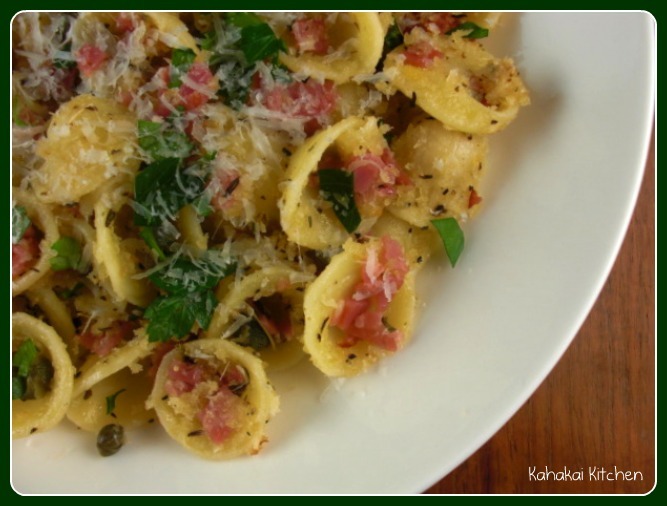 Pour into large serving bowl and garnish with chopped parsley. 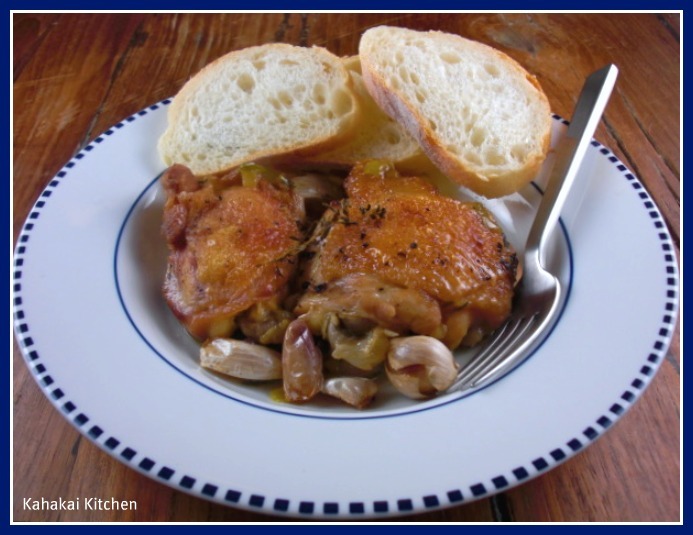 Notes/Results: Quick, simple and delicious--what's not to love with this one? I did make a few changes as mentioned above that I think really added to my enjoyment of the recipe. (Gotta have me some capers.) 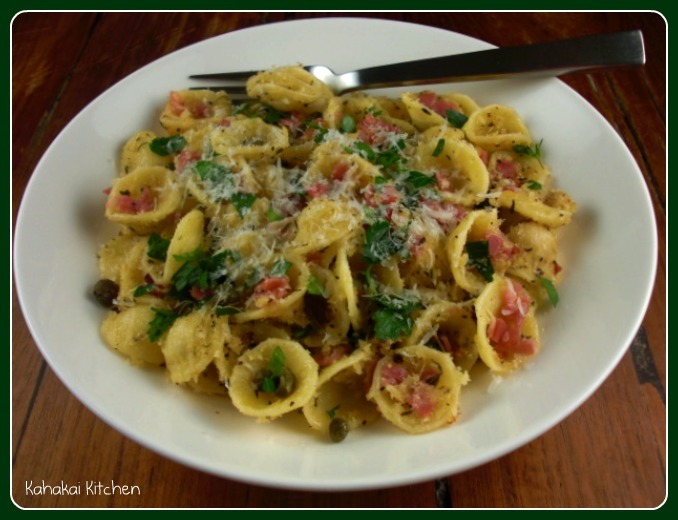 I really like the orecchiette in this dish as the little "cups" of the ears cradle the toppings so nicely. This was on the table in a little over 20 minutes and tasted great--making it perfect for a busy weeknight meal. I will make it again. You can check out what the other IHCC participants chose as their Potluck creations for this busy holiday week by going to the post here and following the links. ... OK, are you back? They look pretty yummy don't they?! So I am in the Top 10 Finalists in the Cheese Lover's Choice Fan Voting Category over at the Ile De France site and could use your vote. If you click here, it leads to the site where you can give me (Deb C. on the poll) the number of "stars" you think appropriate for my dish. (5 stars would be nice of course! lol) They were delightfully cheesy BTW--stuffed with chunks of the camembert and spread with even more camembert. In addition to the fan voting category, they have a panel of judges looking at the recipes too and there is cheese for prizes--so kind of fun. I do appreciate your time and effort to vote during this busy holiday week. Voting is open until January 5th. Mahalo! I have friends that swear by elderberry extract and products like Sambucol for keeping colds and flu at bay or at least lessening the effects. 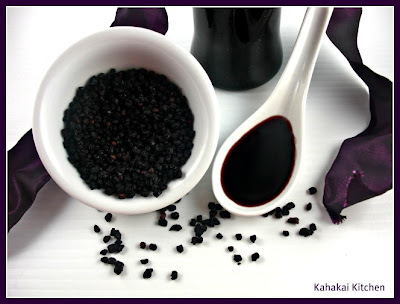 It's not cheap--so when I saw a recipe for a homemade black Elderberry Syrup in the October 2010 issue of Whole Living magazine, I immediately tagged it to make. 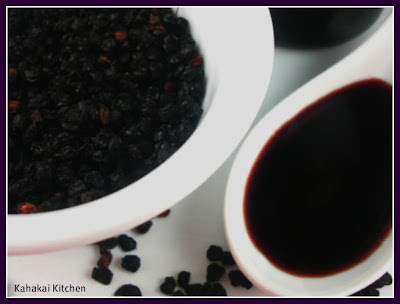 I finally remembered to buy the dried black elderberries at the health food store last week and brewed up a batch. The dried elderberries (found with the bulk teas and herbs) were just a couple of dollars, and along with another several dollars for some local honey from the co-op, I had over a pint of the syrup--which is supposed to last a year. With no artificial ingredients, preservatives or processed sugar, it seems like a pretty good deal to me. Step 1: In a saucepan, cover 2 ounces of dried black elderberries with 1 quart water. Boil. Turn heat to low; simmer until reduced to a pint. Strain. Step 2: Return liquid to the pan. Using a wooden spoon, slowly stir in 1 1/2 cups of honey into the mixture until honey is thoroughly dissolved. Step 3: Let the syrup cool to room temperature. Pour into a clean jar with a tight-fitting lid. Label and date. It will keep up to a year in the fridge. What's your favorite home remedy? For those of you who think it is always sunny in paradise (OK, it mostly is), it is pouring down rain today and cool enough for sweats, socks and a long-sleeved tee-shirt. Obviously much milder than the weather in many other places, but still perfect for a bowl of hot, comforting, hearty soup, like this Beans & Greens Soup with Ham. I had a free half ham from a grocery store coupon program, that I promptly chopped up into pieces to freeze for soup, and saved the big meaty bone to add to stock. 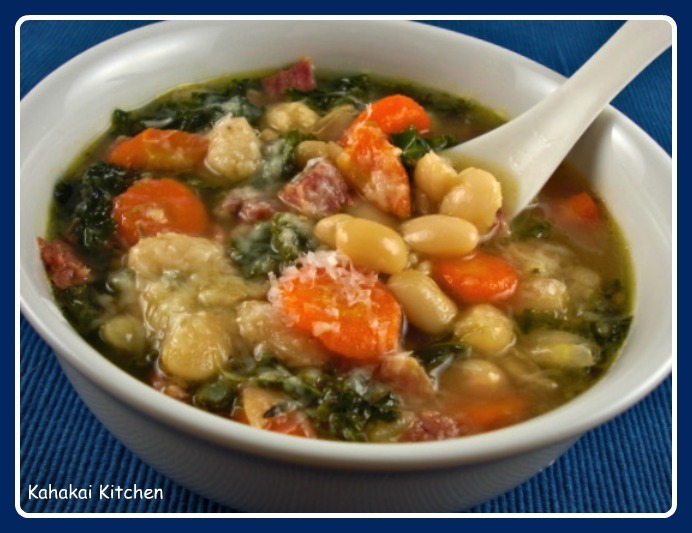 I wanted a very bean filled soup so I used lots of dried cannellini beans. I added garlic, rosemary, thyme, bay and homemade chicken stock for extra flavor. For the veggies, the usual suspects of onion, carrot and celery, plus some chopped kale for extra nutrients. It smelled incredible cooking and tasted great, even better the next day, especially with a little grated Parmesan on top. Soak the beans overnight or put the beans in a large pan and cover with cold water and bring to a boil and cook rapidly for 2 minutes; remove from heat, cover and let sit for 2 hours. 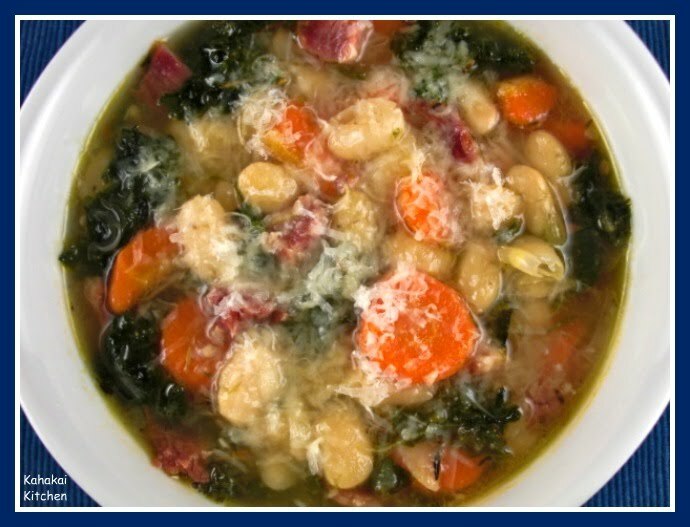 Heat the olive oil over medium-low heat in a large, heavy-bottomed soup pot or Dutch oven. Add the onion, carrots and celery and cook over low heat, stirring occasionally for about 10 minutes. Add the garlic, rosemary, thyme, and bay leaf, and continue cooking for another 5 minutes until vegetables soften. Add the drained beans and ham bone to the vegetables, cover with the stock and leave to simmer for about 1 1/2 hours, or until beans start to become tender. Remove the ham bone, let cool and cut off any usable meat, discarding the fat. 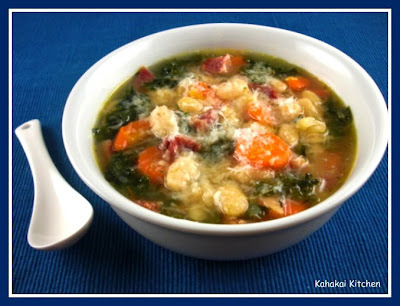 Meanwhile, add the chopped chopped ham and kale, pushing the kale down beneath the surface of the soup. Simmer everything together for another 30-40 minutes until the beans and kale are both tender. Salt and pepper to taste, and serve with freshly-grated Parmesan cheese on top. Notes/Results: Full of flavor and perfect comfort food. Rosemary and thyme are perfect with the beans, kale and ham. You could of course use a couple of cans of beans instead of dry to save time, but there is something about having this bubbling away low and slow for a couple of hours that is cozy on a cool, gray day. I would make this again. Let's take a look into the Souper Sunday kitchen and see who is here. girlichef is here with a soul-filling Pork Noodle Soup with Bean Sprouts and Spinach adapted from a Nigella Lawson recipe and inspired by a movie. She says, "Ramen Girl is one of our two featured flicks this month over at Food 'n Flix (the other being Waitress) this month. 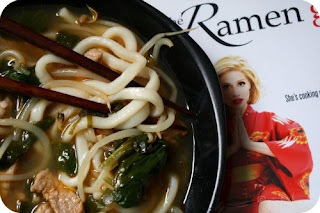 I love The Ramen girl...it's a fun, foodie chick-flick that I won't ruin by giving any more away. I was totally inspired to make a bowl of noodle soup...with broth, noodles, veggies, and meat that would transport me to another level. Check it out..."
Megha from Live to eat!!! has a warming, spicy soup to share, this Rajma (Kidney Beans) Water Rasam. 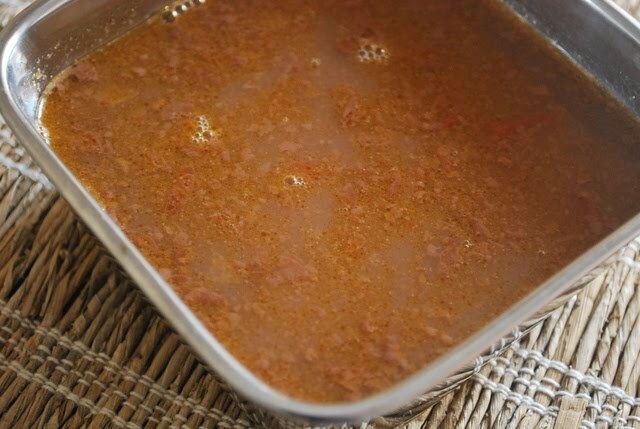 Megha says, "It's winter and all you want is a nice hot bowl of soup or rasam.Why not make some hot and spicy rasam with the left over rajma water. It has a nice thick consistency; good enough to use it for soups and rasam. Why not make some hot rasam for this winter!The Indian spices and the tangy tamarind taste can really help your senses open out...."
I am happy to welcome a new face to Souper Sundays this week, Ashleigh from Pregnant Again, is here joining us from snowy Ontario, Canada and here with a filling Potato and Pea Soup. Ashleigh says, "Its minus 19 where I live today and the snow is deep. This soup is cheap, healthy and hot." It looks delicious Ashleigh, thanks for joining in! 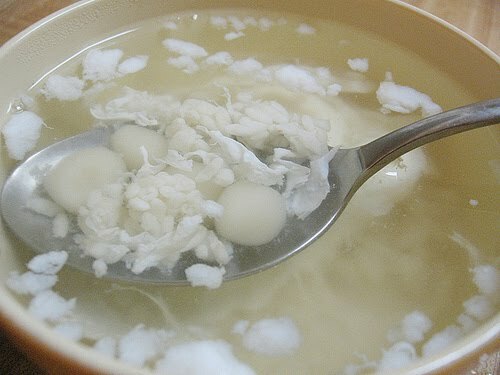 Tigerfish from Teczcape-An Escape to Food has a very unique dessert soup to share, Boiled Glutinous Rice Dumplings in Fermented Glutinous Rice Wine - 酒酿圆子. She says, "As this dessert is typically serve warm and due to the presence of "wine" from sweet ferment rice; it is indeed a timely dessert soup for winter. The first time I tried this dessert was many years ago in Singapore." Pam from Sidewalk Shoes makes the most of her weekly rotisserie chicken by using it in lots of dishes and making soup out of the bones, like her Aunt Sissy's Chicken Soup. Pam says, "When my children were smaller, we would go visit my Aunt Sissy and she would make us a chicken soup with cabbage in it. We loved it. 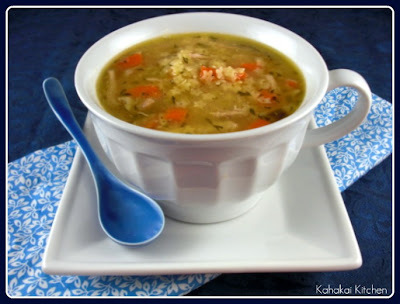 It has become one of my favorite chicken soups to make. 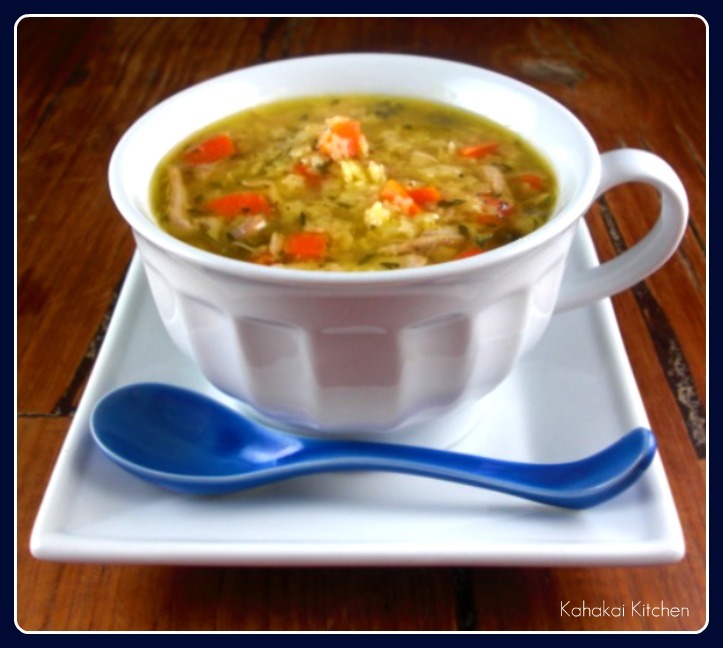 If you haven’t tried cabbage in your chicken soup, give it a try!" 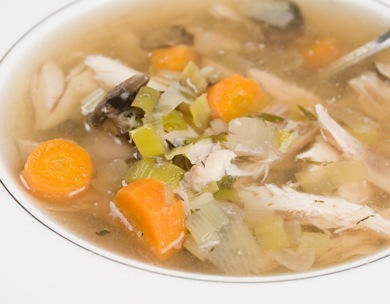 Zibi from Fresh Slowcooking has a restorative Hearty Chicken Soup with Leeks and Mushrooms. She says, "Fighting another cold, I didn't have the energy to dice and brown chicken breasts, so I slow cooked the whole chicken with the vegetables. I shredded the chicken into bite-sized pieces after everything cooked and added it back to the soup. 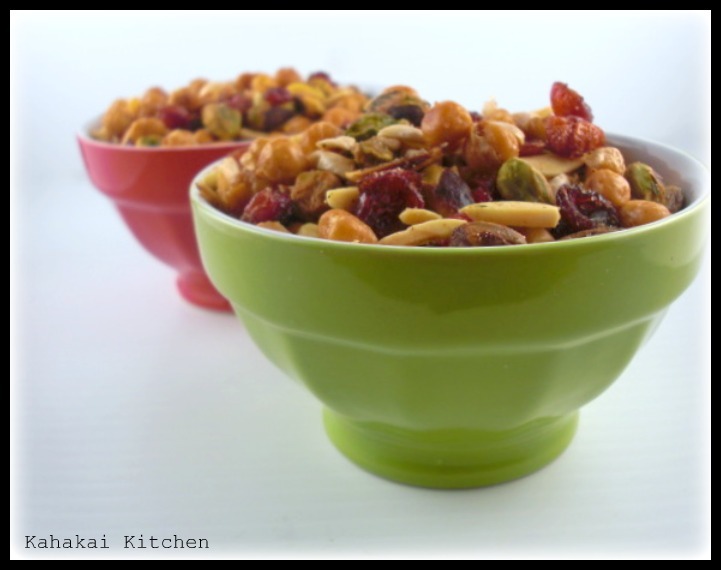 After enjoying a couple of bowlfuls, I felt revitalized. This chicken soup containing chunks of chicken, healthy vegetables and a rich chicken broth did the trick :)"
It's nice to have Grazinana from Erbe in Cucina back with us this week with mini-sammies, these Sage and Mint Bruschetta. She says, "I use often the sage and mint combo during autumn, because they look green and healthy even in these months.This bruschetta was inspired by the tapenade and improvised with ingredients I had in my fridge. It has a rich aroma and a refreshing taste, and it's an excellent appetizer for a hot autumn lunch." There you have it--warming soups and little sandwich treats. Thanks to everyone who joined in this week and welcome to Ashleigh. If you have a soup, salad or sandwich that you want to share, just click on the Super Sundays logo on my sidebar for all of the details. Have a great week before Christmas! My Tate's Bake Shop Giveaway Winner!! !